During the cold wet days of spring, seed catalogs can only do so much to satisfy the primal urge to dig in the dirt. Unless you are fortunate enough to have a greenhouse, you may find that you can reach that “happy place” by growing bonsais. It works for me! 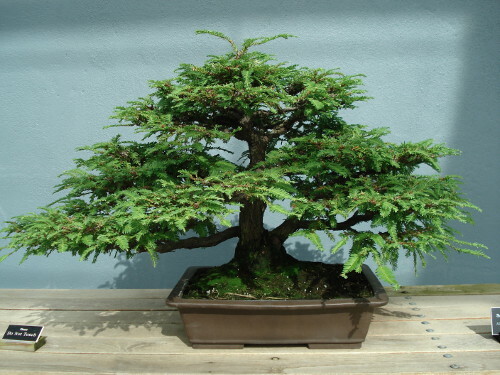 Different species of plants are grown as bonsais for indoor or outdoor display. There are several tasks associated with this art form that are performed in the late winter months. Bonsais do best with regular monitoring for water (especially proper drainage, if grown outdoors), light pruning, moss control, and perhaps most importantly, planning. As I look out my window at my humble bonsai collection, I am transported to that inner-growing place that I seek in late winter. By studying each branch and bud, I find inspiration for my quest to grow bonsai trees that I would be proud to show to others. I explore each plant to prepare for upcoming re-potting, pruning and wiring. Written notes are helpful to remind you of what care you give your plants. Without foliage on the deciduous varieties, it is easy to see where improvements can be made, but even conifers and other evergreens seem to beg for attention at this time of year. While the conventional methods for shaping these miniature trees is using aluminium or copper wire and proper pruning techniques, I get a certain satisfaction from departing from the norm and tying weights onto branches, wedging small wooden blocks between branches, or tying branches down to the benches or under the pots. Care must be taken not to split or cut into branches, but the more you shape and control these plants, the more they become a part of you. The real payoff of growing bonsais is that you have to slow down and wait for the plants to respond to your training (a valuable lesson for all of us). Monitor the effects of any training techniques you use to ensure you have not been too “heavy-handed.” Time can heal all wounds. Plan on keeping your bonsais for life, so treat them well. As you fulfill their needs, you will find that your needs will be met as well.